The Cannon Group took a bath with the failure of MASTERS OF THE UNIVERSE in 1987, a film that had gone over budget and well beyond schedule. The film starts off in the mythical land of Eternia, where the ruthless villain Skeletor (Frank Langella) has managed, with the help of a powerful musical cosmic key, to capture Castle Grayskull, the source for a wealth of magic and power in the region. Skeletor has taken the powerful good Sorceress (Christina Pickles) prisoner and has been draining her of her essence to channel into his own, making him more powerful as time goes on. 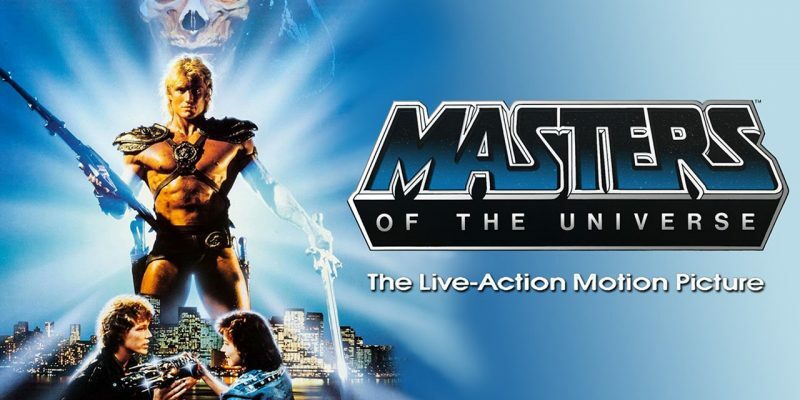 However, the great hero of Eternia, He-Man (Dolph Lundgren), is still free, and with his cronies, the faithful Man-at-War (Jon Cypher) and his daughter Teela (Chelsea Field), he seeks to thwart Skeletor’s plans for dominion over Eternia and restore Castle Grayskull back to its original state. Their plans go awry when the cosmic key’s creator, the dwarven creature known as Gwildor (Billy Barty), opens up a portal to modern Earth with a prototype of the same key for them to escape Skeletor’s clutches. The key is lost on arrival to Earth, soon found by a couple of high school aged teens named Julie (Courteney Cox) and Kevin (Robert Duncan McNeill), who activate it thinking it must be some newfangled musical device. However, using the device alerts Skeletor as to its whereabouts, and once he has pinpointed its location, he sends a band of mercenaries to recover the key and ensnare He-Man, of whom he plans to make an example of in custody to break the will of any would-be heroes left in Eternia.